A Couple of Farmers At Maple Lawn Farm: How Do I Train a Cow to Milk? I am often asked if it's better to purchase a trained cow or buy a heifer calf to raise and train as a family milk cow. It seems that most people are persuaded to get a cute little calf with the idea they can bond with it and then train it more easily. While this is true on some levels, the process can be a lot more difficult and involved than what many family cow owners have considered. Sometimes we tend to forget that animals are not human and while human/animal relationships can and are formed, bovines are bovines and process accordingly. We rely on their instinctive nature to birth and nurture a calf, but we often times get frustrated with them when they don't understand what we are asking of them. For this reason, I always recommend to start out with a healthy, well trained family cow. Starting a home dairy is hard enough without adding the stress of teaching a newly freshened heifer how to be a milk cow. With that said, there will be those who can't resist the chance to buy a cute little calf to raise. Or, if one does buy an already trained cow, eventually that cow will have a heifer calf and your family might just want to keep her to raise as a replacement or to provide additional milk. Training a first calf heifer without some prior planning is probably not a good idea. A lot of people like to halter and lead train their family cows. In theory, this makes it easier to move the cow from place to place, to trailer the cow if necessary, and to direct the cow to the milking parlor and stanchion. This blog post is not about halter breaking and lead training a cow. To be honest, I do not halter or lead train my cows and have not had any issues in getting them to respond to me. If you will find it necessary to move your cow across a busy road or through an area that is unfenced on a regular basis, then haltering and leading training would be beneficial. Otherwise, with a good set up, it's not a requirement. Knowing more about the nature of cows and how they think will help a person regardless if they halter and lead train or not. An excellent chapter in the book ANIMALS MAKE US HUMAN by Dr. Temple Grandin explains the nature of bovines in detail and is a must read in my opinion. Getting the cow into the stanchion and comfortable can sometimes be the easy part. Many times a cow does not want her udder handled. She instinctively knows that part of her anatomy provides for the baby and she is protective. If you are able to touch the cow's udder and let her familiarize herself with your touch before the calf is born, this is good. Word of caution: Do not actually milk the cow before she gives birth. Just touch her udder and her teats and let her learn to trust you. She may kick at first, so be careful. If you are fortunate enough to have your heifer trained to come into the stanchion and tolerate your touch before she calves, you are miles ahead of the game. However, once the calf is born, the heifer's body will be under the influence of some powerful hormones making her extremely maternal and protective. Your sweet, compliant cow may be a beast you don't recognize. BE CAREFUL. Even if you think she is completely trustworthy, be smart and very aware as you handle her and the calf. At this point the cow's udder is very tender and often very swollen. Remember that it's just a normal reaction for them to kick at something that is uncomfortable to them. Wash the udder gently. I use barn towels and a solution of iodine. Some people use just water or water and vinegar. If you are hand milking, you have the advantage of a quiet environment. If you are machine milking, it's actually important to expose the heifer to the sound of the machine as she is in the stanchion prior to milking her for the first time. If you have not done this, the first time she hears the vacuum pump start it will be an additional fear for her. We personally always try to milk without using restraining devices on the heifer/cow. We don't want them to get use to being restrained in order to be milked (aside from the boundaries provided by the headgate and stanchion bars). Training them from the beginning that kicking isn't acceptable is our goal. 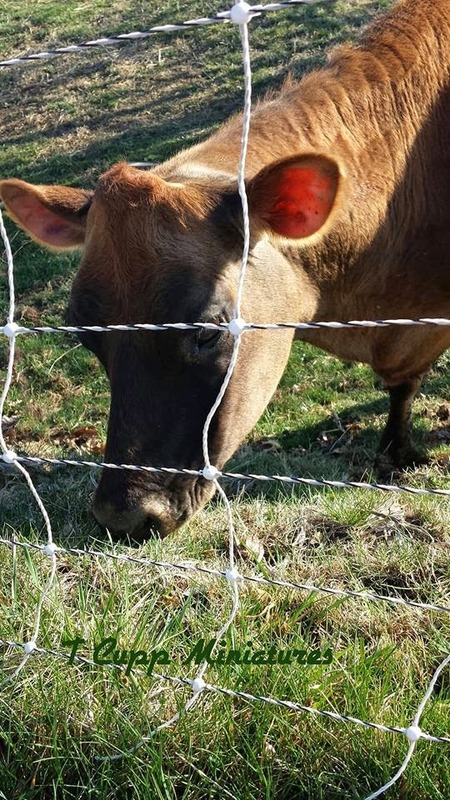 However, if one is a novice, afraid, or it is evident that the heifer is going to be uncontrollable, then one would want to use some method of restraint. There are several ways a cow can be restrained. There are several different types of anti kick devices like the Kick Stop and the Kow Kant Kick, hobbles, or even a rope used properly can work. Do be careful using restraining devices. If used improperly, they can cause injury to both the cow and the individual milking the cow. Always remember to remove the restraint when you are finished milking. This may sound evident, but it's not uncommon to forget this step and cows can be injured when turned out with restraining devices still in place. If you have two people available, you can also do what is called "tailing" a cow. One person simply stands directly behind the heifer/cow and holds her tail straight up firmly where the tail and rump meet. When held straight up, theoretically, the cow can't kick. My husband and I actually use this method quite often the first time we milk a heifer if it is evident that she is going to kick. (Warning: Heifers are nervous and will often poop and pee while in the stanchion the first few times. If you are tailing a cow, you will end up very dirty.) While this method works in most cases, if done incorrectly it can be dangerous. It is best if you can get an experienced individual to show you how to tail a cow and then let you try it with help. Try to stay calm, no matter what happens when you are milking a first calf heifer. She will pick up on your fears, anger, frustration, etc. Be sure to praise her when she does what you want her to do. Speak gently and firmly to her. Explain what you want. She will learn key phrases over time. On the other hand, don't be afraid to use your voice to let her know when she does something you find unacceptable. If she kicks, loudly yell at her "No". I find that cows will either kick at the machine/hand that is milking them (a perfectly normal reaction. Think about if you just had a baby and someone restrained you and tried to take milk away from your baby. You would kick as well, whether out of fear, anger or because you were sore and uncomfortable.) or, if you have a more aggressive cow, she may kick fast and hard at your body. These are the cows I consider more dangerous. A cow can have unbelievable good aim and strike with great force causing serious injury. A balance between being cautious while not being fearful is of great importance. My way of training a newly freshened first calf heifer is not the only way, but it is the way that works for me. I believe strongly in allowing the cattle to be cattle and live as naturally as possible. They raise their own calves, graze, live in a herd setting, are bred by a bull and even my training methods for milking are gentle and as carefree as possible. I have found that familiarity, gentleness and consistency are far greater teachers than ropes and halters at least for our farm. Restraint is used when necessary to protect us from a cow that is kicking dangerously but those restraints are used as a last resort and discontinued once the cow is no longer a danger to the person milking. On a side note, it has been interesting to observe over the years that my cows who were my biggest pets were usually the most difficult in the stanchion in the beginning, while those who were still a bit shy seemed to be more compliant once they learned that a treat was available for them in the milking parlor. The information in this post is by no means exhaustive but perhaps it will be a starting point for those contemplating milking a first calf heifer for the first time. Love love love thank you do much!!! Thanks for this post! I'm just getting started with a first time heifer, and thought I'd google what others had done. Great info. Thanks for sharing your experience! Best wishes as you train your heifer, Wendy! Thank you for this article! I am getting ready to milk my first heifer (after having a couple trained older cows) and I have to admit, I am nervous about the whole thing but the kind advances seems like such a better idea than the heavy handed, restrained way.